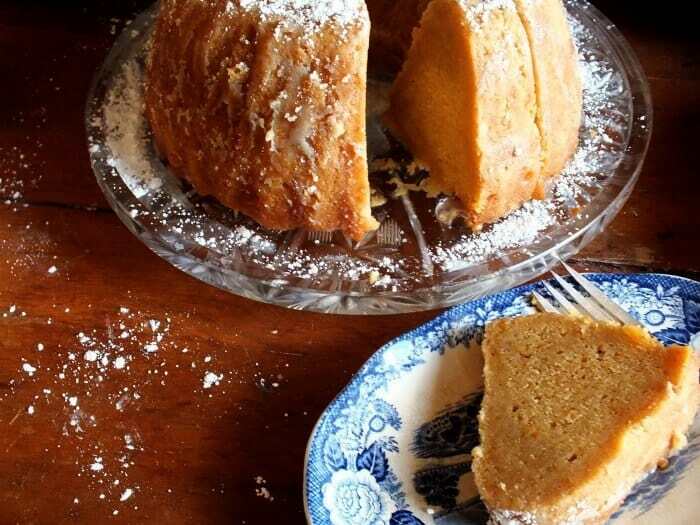 Heirloom Sweet Potato Rum cake has a delicate flavor, beautiful color, and velvety texture. It’s just right for any holiday gathering. Unlike most of the rum cake recipes I have found this one is from scratch start to finish. Well, you don’t have to grow your own sweet potatoes or make your own rum — unless you want to, of course. I was lucky enough to pick up some heirloom sweet potatoes, Crimson Red Velvets, at our local Farmer’s Market. You can use regular sweet potatoes from your grocer as well. Yams are a good substitute. Just make sure that you use fresh ones and not canned. I strongly urge you to try to find heirloom sweet potatoes, though. They make all the difference. Some people may try to tell you that there is no difference between sweet potatoes and yams but that’s not true. They’re not even related! They are very similar but sweet potatoes almost always have a more delicate flavor. Yams have more starch and tend to be dryer. You may also like my Whiskey Apple Cake. It’s full of warm, holiday flavor – absolutely amazing! If you love this recipe please give it 5 stars. A lightly spiced, rum cake with a beautiful color, velvety texture, and delicate sweet potato flavor. Stores well at room temperature for at least a week. Store cake at room temperature for at least 24 hours before serving. Lightly grease and flour a 10-cup bundt pan. Mix the flour, baking powder, cinnamon, and salt in a large bowl. Whisk the eggs, melted butter, vanilla, sugar, and brown sugar together. Stir in the rum and sweet potatoes. Bake about an hour or until a toothpick inserted in the center comes out clean. Combine the water, butter, sugar, and salt in a deep saucepan. Cook over medium heat until the butter melts and the sugar dissolves. Simmer it until it reduces just a little, about 2 more minutes. Remove from the heat add the rum carefully. Let the cake cool in the pan for ten minutes. Now, put the cake right back in the pan (this will help it not to stick) and pour the rum syrup over it. Pour the syrup slowly over the cake, cover, and let stand for at least 24 hours. Invert onto a cake plate and serve. Would you consider putting a glaze or icing on this cake? yes. you can just leave it off the finished cake and substitute apple juice in the batter. I made this recipe exactly as written using regular sweet potatoes. I am an experienced home-baker and this is one of the best cakes I have ever made. The cake is very moist and the flavors are on point for a fall dessert. Thank you! Thanks Monica! That’s great to hear! Joan do you cook the sweet potatoes? Bake them or boil them? Maybe it doesn’t matter?? I bake mine – I think it gives them better flavor. This looks ca-razy good. I need this in my life immediately if not sooner! This looks moist and delicious! Last year I really, really wanted to make rum cake, but it just didn’t happen. This year, I most definitely am going to do it. The texture of this cake looks amazing. It is! Let me know what you think! 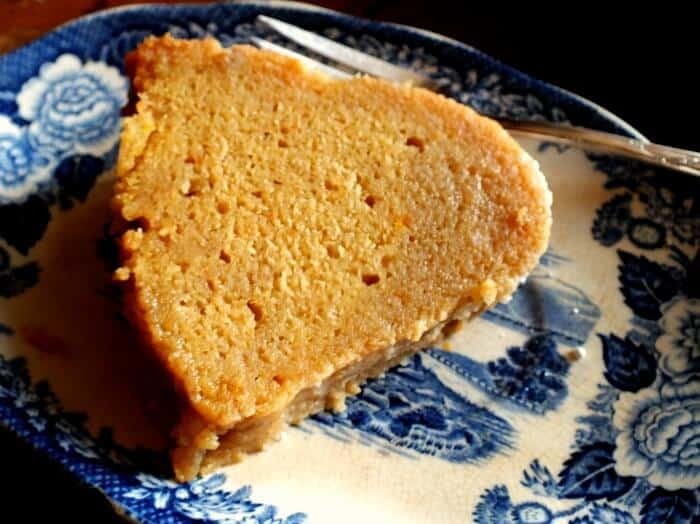 I love sweet potato cake (and pie! ), and with the rum in there it sounds so perfect! It does go well, Julie! Bourbon would be great too! Marye – you have a wonderfully textured cake here! It looks so incredibly moist and luscious! Such a beaut! You had me at RUM! haha! 🙂 Looks fabulous! I really need to bake more with sweet potatoes and this looks like the perfect recipe to get started on that. This cake looks awesome. I love the idea of adding sweet potato to a rum cake. It really is unique and so yummy! I am totally digging that fact that you added RUM to this cake! And with sweet potatoes?! GREAT COMBO! O I love the rum! Perfect flavor! I am not sure why there have not been any comments since you wrote this post, but I definitely have baked this cake at least twice for Christmas and New Year’s. I love all the options you suggest for this delicious cake! This looks marvelous. I hate to admit I have never had a rum cake, but I want to have this one. I love the velvety texture of this!! Yum! I love sweet potatoes and anything that involves them! This sounds great, and looks super moist. What is the difference between a regular sweet potato and an heirloom?